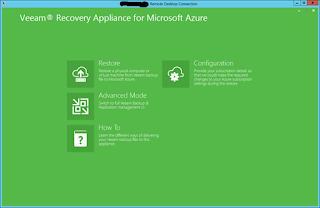 The Veeam Direct Restore for Microsoft Azure virtual machine is available in the Azure Marketplace and is a handy tool for restoring VMs into Azure IaaS. 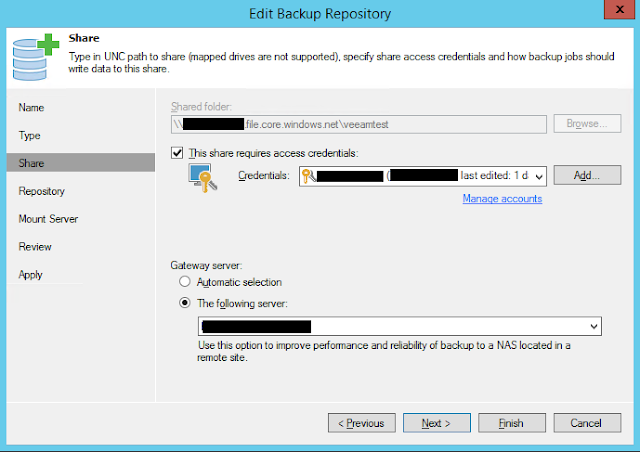 This method works for both VMware and Hyper-V virtual machine backups. 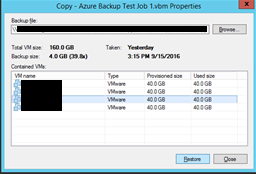 Getting your .vbk backups into Azure is the first challenge. I have found the simplest method for regular backups is to use Azure Files / MAFS and mapped drives in Windows. The next method is to use the MAFS share as a repository in your Veeam B&R setup. To do this simply set up the repository as a CIFS repository and use the storage account name as the username and the key as the password. Remember this method will be more read/write intensive than simply copying the files you need onto the share as it will need to do backup rollups and other B&R repository functions on the file share. Performance of this method isn't bad and on our 200 Mbit internet connection we were reaching 17 MB/sec sustained throughput when we seeded the backup share. Over the next few days I will be testing the IO impact of running this as a repository. There are also speed limits and quota limits on each file share and storage account which will need to be taken into account if this needs to be used at scale. 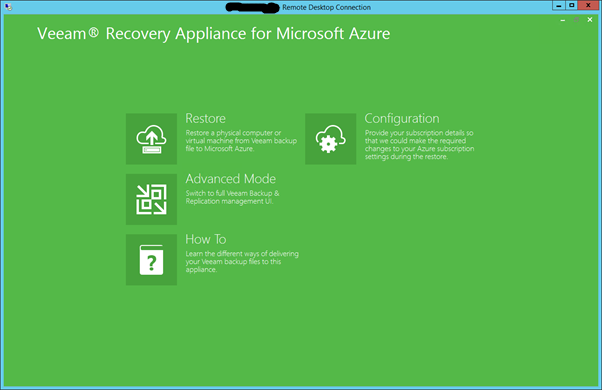 The first step to restoring your VM as a classic Azure VM / Cloud Service is to deploy the Veeam Direct Restore for Microsoft Azure virtual machine from the Azure Marketplace. Once your machine is deployed and you have connected via RDP you will be presented with the Veeam Direct Restore UI. Back in the Veeam UI, click the configuration button and complete the wizard by logging into your azure account, downloading the credential file and pointing to it in the wizard. 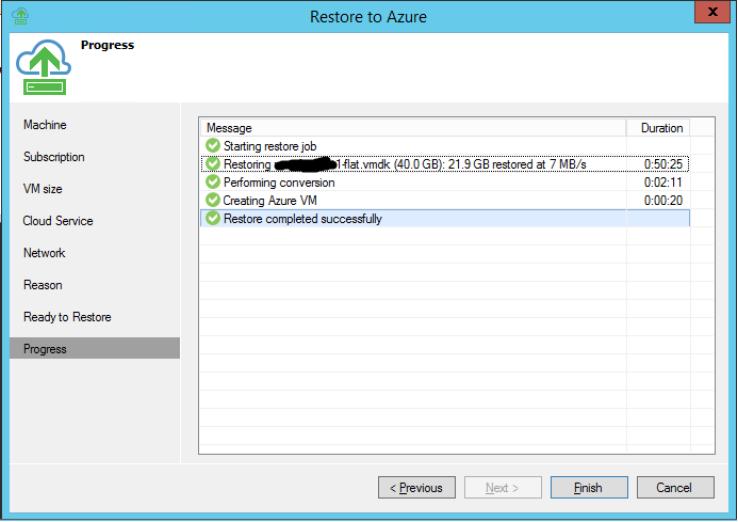 Once you have completed the configuration, you should then be able to perform a restore using the restore button in the UI. When you select the file from the MAFS share, the wizard will ask for credentials, enter the storage account name as the username and the access key as the password. You should then be presented with a list of VMs in the backup, ready to restore. Select your VM, click restore and the backup will be imported. 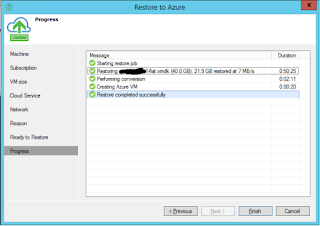 You will now be shown the Restore to Azure wizard. You will need a pre-created classic storage account in the region you want to restore your VM to. 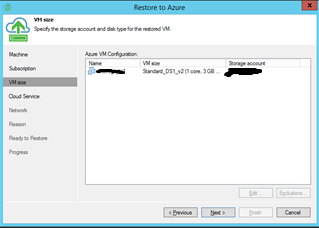 Once the restore is completed, the VM is automatically started in Azure. It's not fast. If you're used to dedicated backup hardware and fast disk based restores, you could be in for a shock. The restore performance I got from this was around 7 MB/sec or 25 GB/Hr. This could be because I was running the software on a D1_v2 Azure VM which has a NIC limited to 100 Mbps. I was also copying from North Europe to Central US DC since I can only make classic VMs in certain regions. I'll do some benchmarks on a larger machine at a later stage. It doesn't scale well. Azure file shares are limited to 5 TB per share. You could have multiple shares but that could quickly get difficult to manage. Only parts of this can be automated. The restore process is quite hands on so I wouldn't want to rely on this as my only DR solution. If you're an EA customer with Microsoft it may be best to investigate the StorSimple cloud appliance solution which should scale much better and provide much better performance. Thanks for your blog. I just landed up in your blog and I really appreciate your blog. It is full of resourceful information about Azure migration.